Welcome to the first issue of my new newsletter. For now, I'm going to try making this a weekly newsletter, but depending on the amount of interest and material I have, I may switch to a monthly format. We'll see how it goes. I've just turned in a new article for Skeptic magazine exploring the popular claim that Native Americans discovered Europe in 60 BCE. This article is a greatly expanded and more detailed version of my May 15 blog post on the subject, and it has some fascinating new facts that shed even more light on the origins of this weird claim. I've also turned in the promotional jacket copy for my new book, Cthulhu in World Mythology, due out from Atomic Overmind Press this fall. The book is a parody of the Ancient Aliens and Chariots of the Gods school of history, and even the jacket copy is a satire on the overblown marketing claims of "alternative" authors. Here's a taste: "This scholarly masterpiece by history’s most insightful scholar of prehistoric extraterrestrial intervention upends academia’s traditional view of ancient mythology." Did a French priest narrowly miss being crushed by a dinosaur in the Congo in the 1760s? Did Native Americans bring South American pineapples across the Atlantic to Pompeii? Did prehistoric Africans carve Saharan camels on a Peruvian mountaintop during the Ice Age? Here are some of the most interesting links I've tweeted this week. The New Yorker on the first extraterrestrials in fiction. Controversy over a Venetian "vampire" grave. An early review of Ridley Scott's ancient astronaut movie Prometheus. Atomic Overmind Press set a publication date of September 2012 for my new book, Cthulhu in World Mythology. To help prepare, I’ve made a book page you can check out here. Skeptic magazine has also set a publication date for my new article on the alleged Native American discovery of Europe in 60 BCE. The issue will be out in vol. 17, no. 4 (Fall 2012). Egyptian dog chariots in Olmec Mexico? Did the CIA find Noah’s Ark? Ancient astronauts, Soviet geopolitics, and the Spitsbergen UFO hoax. Hollywood aliens are our own projections, steal from ancient mythology. Rabbi to hold class debunking Ancient Aliens because too many congregants wonder if ancient astronauts are real. Bulgarian “vampire” skeletons uncovered in monastery. Progress continues on putting together Cthulhu in World Mythology for a September release. I've been asked to contribute to Swans magazine's forthcoming edition on postmodernism and New Age beliefs. And I've apparently been blocked from reading Giorgio Tsoukalos' ancient astronaut tweets. I don't know why. Be sure to check out the material I've posted from the U.S. government's secret ancient astronaut and alternative history files. Ancient Astronaut Hypocrisy: Did Erich von Daniken Think Jesus Was an Astronaut? Robert Temple and the CIA Persecution: Where's the Proof? 'Prometheus' vs. 'At the Mountains of Madness': How Ridley Scott killed Guillermo del Toro's dream project. New dating method shows cave art is older: Did Neanderthals do it? WaPo says 'Joss Whedon: The Complete Companion' is too dull, too academic for its fun subject matter. This week I've started work on a reprint edition of Cory's Ancient Fragments, an important collection of materials used by ancient astronaut theorists. Currently available editions tend to be error-ridden OCR transcriptions or blurry photostats, so I'm resetting the text from the original and hope to have an affordable, attractive hardcover. I'm hoping to have it finished sometime in the next month or so. Buzzfeed presents 15 Terrifyingly Awesome Cthulhu Tattoos. Authors show how Easter Island’s statues walked, illustrating controversial theory many archaeologists don't accept. Great comic strip: The ancient astronaut theory--teach the controversy! This week I've been working on Cory's Ancient Fragments, but I had no idea it would be such a complex project. Apparently the 1876 editor didn't feel the need to correctly cite any of the sources. Trying to track them down has been "fun." Reviewing NatGeo's "Chasing UFOs": Can Aliens Be Boring? Loch Ness monster cited by Louisiana Christian schools as evidence that evolution is myth. Woman’s lawsuit claims sexual abuse during exorcism. Priest allegedly used "devil" infestation claim to fondle woman. Witnesses: Islamists destroy ancient sites in Timbuktu as "un-Islamic." In this week’s newsletter, I’m going to break format and talk a little about the new book I put together, Cory’s Ancient Fragments. This book collects in one place nearly everything that the Greeks and Romans preserved of the historical records of the Near Eastern civilizations that preceded them. Until the translation of the cuneiform inscriptions of Mesopotamia, these fragments were nearly all that was known about Assyrian and Babylonian history and religion. Cory’s Ancient Fragments contains the texts of the Phoenician cosmology of Sanchuniathon, the controversial fragments of Berossus that some believe document extraterrestrial contact, as well as fragments about Atlantis and other vanished civilizations. 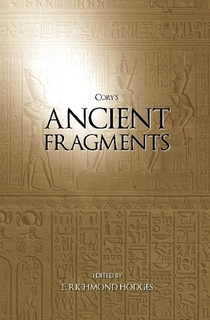 I. P. Cory first published Ancient Fragments in 1826 and delivered the much expanded second edition in 1832. In 1876, E. Richmond Hodges re-edited the work, adding a wealth of new material but deleting fragments he found distasteful, especially those that touched on cosmology instead of Biblical history. Now, all of these editions are available online, but I’m sure that many of you, like me, would prefer to have an important reference work in print rather than electronically. It’s much easier, for me at least, to thumb through a printed book than to scroll through e-text, especially if I don’t have a specific keyword in mind. The problem is that if you want one of these volumes in print, you have unsatisfactory choices. The first is to buy an original nineteenth century edition, which is exceptionally pricey and also not practical for reading, for fear of damage. The second option is the on-demand paperback reprints that either reproduce the original from blurry photocopies or optical character recognition reprints that are chock full of errors and bad formatting. I don’t want to pay $25-30 for that, especially with their ugly paperback covers. And even if they were satisfactory reproductions, we have the problem that E. Richmond Hodges and his publishers produced a pretty bad volume. The citations for the fragments were incomplete and some were missing entirely (some of these were Cory’s fault); the formatting was wildly inconsistent. Some of the notes were placed in the wrong place. Anyway, I made my version a library-quality, case-wrap hardcover that I plant to keep for years to come. I designed the heck out of the cover it, and I think it came out nicely. So, for my newsletter readers, I thought I’d share the link in case any of you would be interested in buying your own copy. At $22, it’s a little pricey, but you’ll be getting an updated, corrected, and formatted hardcover for less than most on-demand publishers’ slapped-together paperbacks. I’m not looking to make money off this. (With a $2 profit margin, I don't think that's possible!) I made the book for my own use, but I think that many of you may find it useful, too. I received my copy the other day, and it looks beautiful. The cover really pops, and I’m proud of how it turned out. I design all my own covers for my print-on-demand books, and I think it’s one of my better efforts. You can buy a copy here. This week I released my second JasonColavito.com Books reprint edition, Sea Monsters Unmasked by Henry Lee, a skeptical masterpiece about the origins of sea monster myths. It features some of my best graphic design in the cover art, and I think I did a good job making a beautiful book that comes in at least 40% below other print-on-demand publishers' versions. Be sure to check it out. I also wanted to give my newsletter readers a sneak peak at my forthcoming print-on-demand anthology tied to the upcoming release of Cthulhu in World Mythology. The chapbook-sized The House of the Octopus will present five classic essays about the real-life Cthulhu cult of the Pacific that worships and octopus god and his undersea stone temple, is associated with megalithic ruins, dies and is resurrected, and is associated with madness and death. It sounds like fiction but it's all true. The book is at the printers and should be available in about two weeks. This week the National Archives finally delivered the U.S. State Department's Erich von Däniken file after a full month of trying to obtain it. The documents are a fascinating portrait of the first international ancient astronaut celebrity at the height of his popularity. Von Däniken had written to then-president Gerald Ford to advocate a range of political views, including unilateral abrogation of a U.N. convention on demilitarizing space and the need to pander to UFO believers as a voting bloc for the 1976 election. I've posted the whole thing here with an analysis. The interesting thing is that the U.S. government didn't seem to care at all about ancient astronauts, while we learned this week that the Chinese government is endorsing the theory (see below). I've also put up for sale the new chapbook The House of the Octopus about the real-life octopus-worshiping "Cthulhu" cult of the Pacific. Right now it's in paperback only, but I hope to have an eBook version available soon. Why Are Sitchin's Aliens Obsessed with Gold? A source for the Hounds of Tindalos? I discovered that I’m mentioned as a horror scholar and expert in the major new book from Viking, Rabid: A Cultural History of the World’s Most Diabolical Virus, by Bill Wasik and Monica Murphy, which was cool. I sent in the final edits for Cthulhu in World Mythology, which is scheduled for publication this September. I’ve also been asked to contribute my eBook “The Origins of the Space Gods” to volume 6 of the Fortean anthology series Dark Lore, scheduled for publication this fall. So you can look for a revised and updated version in that upcoming volume. Finally, I sent to the printers my newest JasonColavito.com Books reprint edition, George Smith’s 1870s bestseller The Chaldean Account of Genesis, which shocked the world with the first reports of the Babylonian Flood myth and the Epic of Gilgamesh. The book should be available for sale on my website later this week. Ancient Aliens talking head searches for alien-human hybrid babies and a lost super-civilization. Did George Smith inspire Zecharia Sitchin? Coming up: Over the next week I’ll be reviewing Erich von Däniken’s most recent ancient astronaut book, Twilight of the Gods, on my blog chapter by chapter. So be sure to tune in! Here’s part one. My new book Cthulhu in World Mythology has reached the layout and typesetting stage and is quickly moving toward publication! My edition of George Smith’s historic classic The Chaldean Account of Genesis is now available! Be sure to check it out on my JasonColavito.com Books reprint editions page. I’ve sent to the printers Edison’s Conquest of Mars, an 1898 novel that presciently predicted the arguments used by ancient astronaut theorists six decades later. I’ve written a new critical introduction to the novel. It should be available by the middle of next week. As many of you have probably already heard, the National Geographic Channel cut me out of my scheduled appearance on the July 29 Secret History of UFOs documentary to focus more heavily on giving a platform to ancient astronaut theorist Giorgio Tsoukalos. I'm obviously very disappointed. I'll have more to say about this on my blog tomorrow, when I've figured out how to write about it without violating the confidentiality agreement they required. There has been a production delay on the printer's end with my edition of Edison’s Conquest of Mars, the 1898 novel that presciently predicted the arguments used by ancient astronaut theorist. It should now be available by the middle of next week. Cthulhu in World Mythology is now finishing up the layout and design stage in anticipation of its publication date just a few weeks from now. Get ready! As I work toward the launch of Cthulhu, my blogging schedule may be a bit lighter than normal. I’ve also put together all of my reviews of Ancient Aliens from the past year as A Critical Companion to Ancient Aliens that should be available from the printer late this week or early next. In memory of Neil Armstrong, the first man on the moon, who died this week, I have written a special account of Armstrong’s involvement in the 1976 expedition that went in search of the cave in Ecuador that ancient astronaut theorist Erich von Däniken claimed housed a library written by aliens. My new companion to Ancient Aliens seasons 3 and 4 should be back from the printer this week and ready for sale by the end of the week. I also examined the deceptive origins the strange claim that Spanish explorers found Caucasians in the New World. For the holiday weekend here in the United States, I'm taking it a bit easy in anticipation of the big fall push for Cthulhu in World Mythology, so I'm going to keep this week's newsletter short. Check out my first ever YouTube video in what I hope will be an Ancient Alien Fraud series: "Nuclear Fallout in the Mahabharata?" based on my article, "The Case of the False Quotations." If you like it, let me know and I'll try to make more. Be sure you've read my blog posts on the fake "white" mummy of Peru and the falsified AP report about alien hybrid Chinese dwarfs. Two more entries in the never-ending list of alternative authors' quotation fabrication. Finally, my Critical Companion to Ancient Aliens Seasons 3 and 4: Unauthorized is now available for sale! I have translated the French science fiction master J.-H. Rosny’s 1887 novella Les Xipéhuz, an imaginative tale of an invasion of inhuman ancient astronauts in prehistoric Mesopotamia, and posted it on my website. Although the story has been previously translated, mine is the first complete translation available in its entirety online. The story is a masterpiece, and of interest to every fan of ancient astronauts, science fiction, or H. P. Lovecraft. We are counting down to the release of Cthulhu in World Mythology, which I swear is going to becoming out this month. I’m waiting on the publisher to send the final page proofs before it goes to press. Finally, I posted a new video on the fossil origins of the mythological Cyclops, which you can view on my Videos page. Pyramids in Antarctica: Where’s the Proof? Is Sirius Mystery Author Robert Temple Really a Professor? I had preliminary talks this week with a major media company about a high profile project. I wish I could say more, but since it’s only at the very early stages, it will have to be a secret for now. If the project goes through, you’ll hear it here first. Otherwise, this was a pretty slow week. How Rod Serling’s Night Gallery gave us Ancient Aliens. Some of you may not have received my September 16 newsletter due a technical error with my mail delivery service. I didn’t even receive my own copy, and the delivery service did not provide an explanation. You can read back issues of my newsletter on my website if this problem should occur again. I just received the page proofs for Dark Lore VII, Greg Taylor’s Fortean anthology in which I have an article on ancient astronauts, alongside other writers’ work on mushrooms, magic, and more. The book is looking great and should be on sale next month. I should be receiving the page proofs for Cthulhu in World Mythology this week. I’m looking forward to seeing how it turned out. You may have seen the little controversy this week caused when I criticized fellow skeptic Benjamin Radford for reporting incorrect material about a supposed ancient astronaut documentary. Here are the links to my posts on the issue: Part 1, Part 2, Part 3. I just received the galleys for my upcoming article in the next issue of Skeptic magazine. My article will expand on my earlier blog post covering the alternative claim that Native Americans landed in Europe in 60 BCE. The article will offer interesting new insights into how this modern myth emerged. I’m featured in the new three-hour documentary Ancient Aliens Debunked. Be sure to check out the film, available for free online. The layout and design of Cthulhu in World Mythology are almost complete as we head into October and impending publication. Remember: It will make a great Christmas gift! I also introduced a new donation feature on my blog this week so you can show your support for my blog and help me to defray the costs of producing high quality daily blog content. Was Cthulhu a king of Atlantis? My review of Paranormal Paparazzi. I evaluate Graham Hancock’s latest pronouncements on lost civilizations and the spirit world. Since this is a holiday weekend in the United States (Columbus Day) and Canada (Thanksgiving), today’s newsletter will be a bit different than usual. My original blog post discussing Coppens’ claim is here. Coppens’ lengthy, inaccurate, and vitriolic criticism is here, along with my commentary demonstrating exactly how Coppens uses manipulation, distortion, and false claims against me. So, since calling him a “liar” is offensive, I will instead say he engages in “a vociferous and vile campaign” to distort and manipulate history. Daily Grail Publishing has released Darklore 7, a new anthology of Forteana in which I have an article, an updated and revised version of my Origin of the Space Gods eBook. You can buy your copy on Amazon or most major online retailers. I haven’t received the galleys for Cthulhu in World Mythology yet, so there may be a production delay of a couple of weeks before the book is released. I am checking on this with the publisher and hope to have more soon. 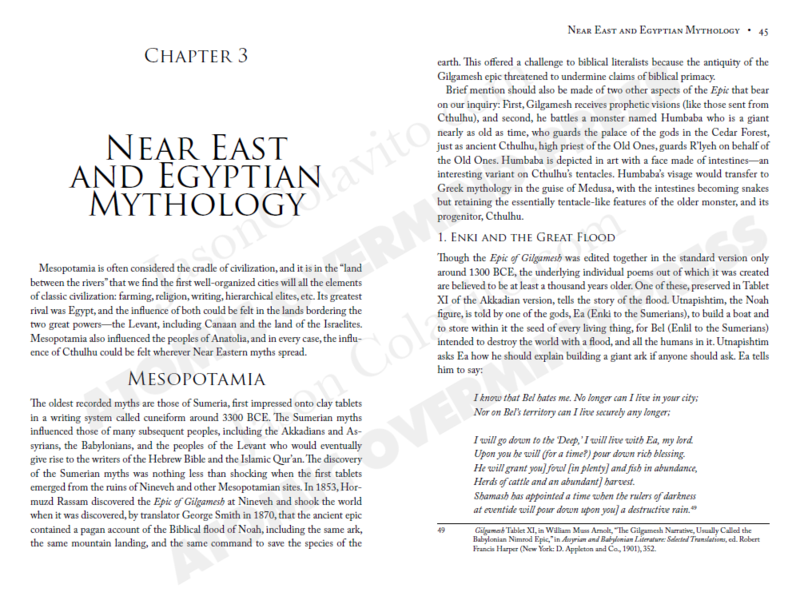 This week, I want to share with you an exclusive first look at the page proofs for Cthulhu in World Mythology, which is making its way toward publication sometime in the next several weeks. The book is looking great, and I hope you agree! Text © 2012 Jason Colavito; layout and design © 2012 Atomic Overmind Press. All rights reserved. Also, be sure to check out my blog posts on medieval Moorish airplanes, Philip Coppens' latest misstatements, and Maya prophecies about Barack Obama. This week I was handed the high honor of having Ancient Aliens pundit Philip Coppens blast me on his blog as a “zealot” trying to steal magician James Randi’s skeptical crown. Read Coppens’ posting here and my response here. It’s good to know that even a small blog like mine can somehow shake an Ancient Aliens pundit to his very core with foaming rage. And finally, as we move toward Halloween this week, don’t forget to check out my work on the horror genre, including Knowing Fear, A Hideous Bit of Morbidity, my Victorian story collection Unseen Horror, and my article on Dracula’s secret school, the Scholomance. As a result of Hurricane Sandy, a lot of projects were unavoidably delayed, including progress on Cthulhu in World Mythology, so it was a rather slow news week in the world of xenoarchaeology. Even the ancient astronaut theorists were mostly quiet this week, though I expect this to change significantly when Ancient Aliens returns to the airwaves with new episodes, promised for later this month. However, I did publish two eBooks this week. Be sure to check out my e-edition of my translation of The Orphic Argonautica as well as a free e-edition of The Epic of Gilgamesh. I also have updated the header for my newsletter. It's definitely better than the old one, but I may try a few other versions. We'll see. Did the Ojibwa meet an ancient astronaut 500 years ago? Iram of the Pillars: A pre-human city? Getting it wrong: When myths and legends lie. First, if you haven’t read it yet, be sure to check out my article on the sociology of ancient astronaut and alternative history beliefs in Swans magazine. The marketing and distribution team feels that the book is going to be much bigger than first anticipated, so they have requested an additional couple of months to market and distribute it to booksellers. But fear not! The current plan is to have two releases. First, by the end of this year the plan is to release a limited edition hardcover version of the book, with a wide release trade paperback to follow in the first quarter of 2013—we’re almost there! Oannes: The “Best Evidence” for Ancient Aliens? This week I’ve been working on preparing a single-volume edition of Edwin Sidney Hartland’s three-volume Legend of Perseus (1894-1896), an important early work in the anthropology of folklore and religion. Things were going well until the printer told me that I crossed a magic page number threshold, mandating a bigger gutter and forcing repagination. Fun! With luck, I should have the book done by this time next week. The print and eBook editions of The Orphic Argonautica continue to be my best-selling JasonColavito.com Books volumes, which surprised me. Who knew that so many people wanted to read it? Are There Platinum Coffins Off Nan Madol? This week I completed my translation of all the references to the pyramids of Egypt in Al-Maqrizi’s Al-Khitat, a medieval Arabic compendium cited by ancient astronaut pundits as proof that aliens assisted in the building of the pyramids. As you can now read for yourself, it says no such thing and these pundits simply took advantage of the fact it hadn’t been translated into English to make wild claims about what the Arabic text said. I also sent off to the printer my single-volume edition of Edwin Sidney Hartland’s three-volume Legend of Perseus. If the proof copy looks as good as I think it will, it will be one of the most beautiful volumes I’ve yet produced. It should be ready for sale within a week. Is the Great Pyramid the Continents’ “Center of Gravity”? Would Believing in Ancient Astronauts Impact Modern Religions? Ancient aliens star Philip Coppens took ill after completing filming of season five of the H2 series and was hospitalized. Let us all send our wishes for a swift and complete recovery. I have officially released my single-volume abridgment of The Legend of Perseus, and it came out beautifully. Be sure to check it out if you’re interested in myth, folklore, and its persistence across time and space. Talos of Crete: A Prehistoric Extraterrestrial Robot? Unfortunately, my carpal tunnel syndrome has returned after several weeks of typing too much, meaning that I’m having a hard time typing. I’d try voice software, but do you know of one that can spell Enuma Elish, Tiwanaku, or Utnapishtim? H2 has announced the return of Ancient Aliens on December 21, so to get all of you prepared, I’ve released my Critical Companion to Ancient Aliens as an eBook, on sale now! Buy it here. Also, Atomic Overmind tells me that the proofs for Cthulhu in World Mythology will be ready for final proofreading this week! I can’t wait to see them. Hamlet’s Mill: Precession or Solar Symbol? Was Oannes John the Baptist or a Sleeping King? Just a reminder: H2 has announced the return of Ancient Aliens for December 21, which is this Friday, so if you haven’t done so, get ready by buying the eBook version of my Critical Companion to Ancient Aliens, ready for instant download now! Buy it here. Ancient Aliens star Philip Coppens announced this week that he is suffering from an extremely rare form of cancer. Be sure to send him your best wishes for his recovery. Today, December 23, 2012, is the day Erich von Däniken claimed in Twilight of the Gods (2009) we would all experience “god shock” when the aliens return. Don’t hold your breath waiting, but if the aliens don’t come back today, remember this the next time you see von Däniken on Ancient Aliens. It has been a long and wild year in xenoarchaeology, and I hope you’re all looking forward to what next year brings. To help get you prepared, be sure to read my reviews of the current episodes of Ancient Aliens and America Unearthed. As we enter the holiday season, I want to take this opportunity to wish all of my readers the most joyous of holidays, whichever (if any) you choose to celebrate. I’ll be celebrating Christmas, so to all those who do, Merry Christmas! For everyone else, Happy New Year! This will be the last Skeptical Xenoarchaeologist newsletter of 2012. I’ll be taking next week off for the holiday, but I’ll be back with more crazy claims and wild ideas on January 6, 2013.